Won Ton Soup is one of my favorites. Maybe it's because I love noodles. I would always judge a Chinese restaurant by how good their won ton soup was. 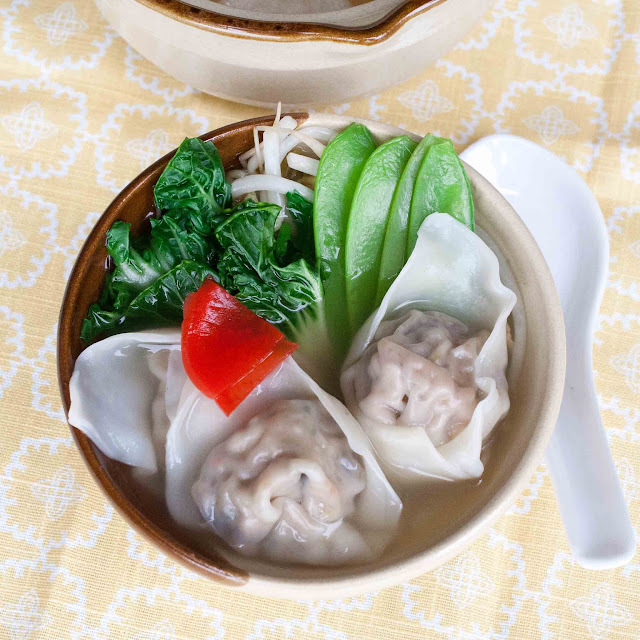 It's surprisingly simple to make, especially if you plan ahead a little and have some won ton skins on hand when you make your gyoza. 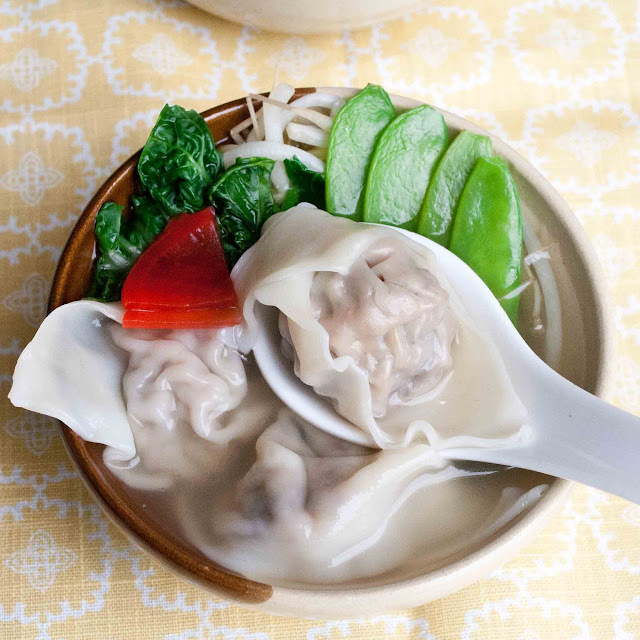 You can make some won tons with the same filling, freeze them, and have them handy for soup! Start with some chicken broth. Home made is by far the best, but you can use canned. 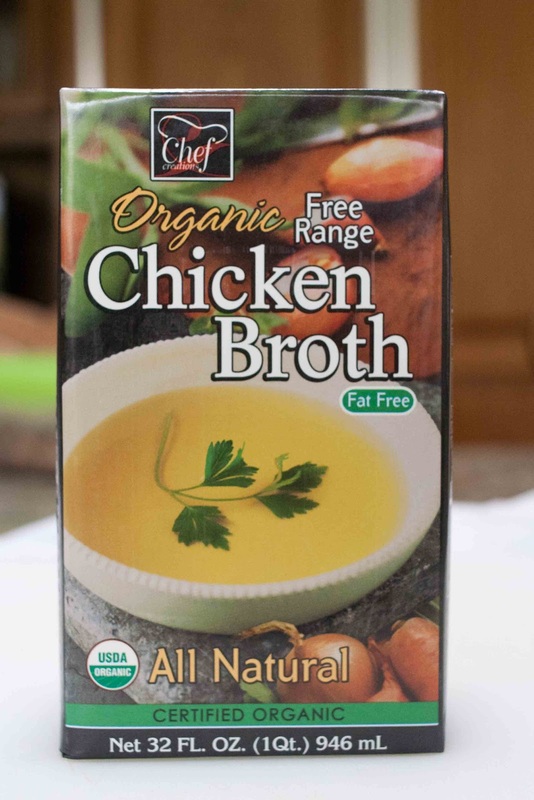 For four cups of stock, add two cups of water. 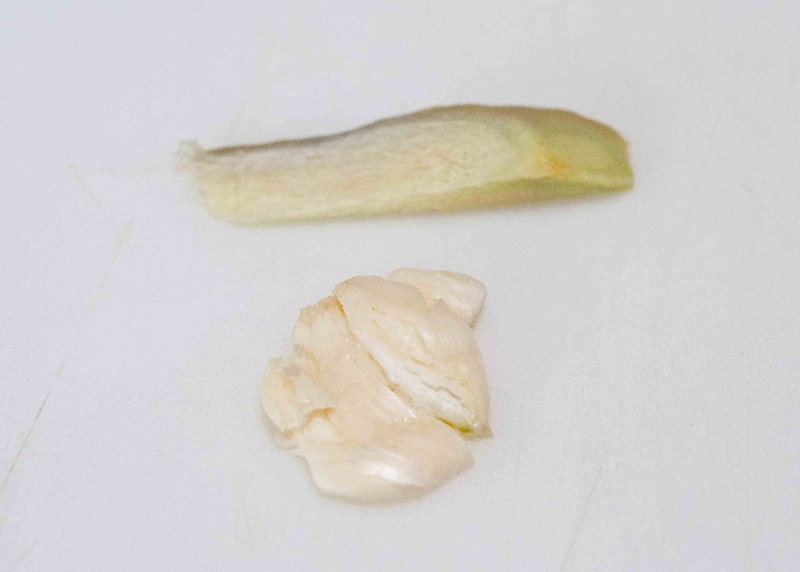 Also add a slice of ginger root and one clove of garlic, crushed. If you have some shiitake mushrooms, thinly slice them and add them, too. 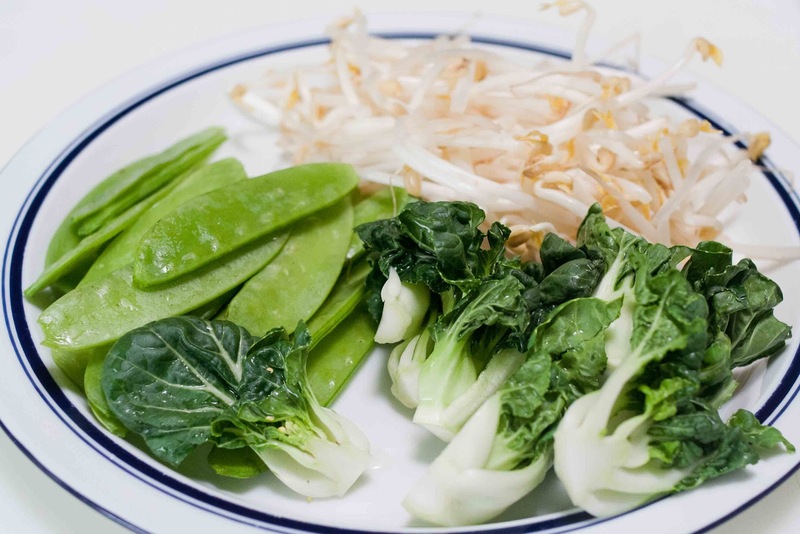 I had these vegetables on hand--baby bok choy, chinese peas and bean sprouts. You can use any vegetables you like. I think non-root vegetables work best. Cilantro is really good in here, as is watercress. 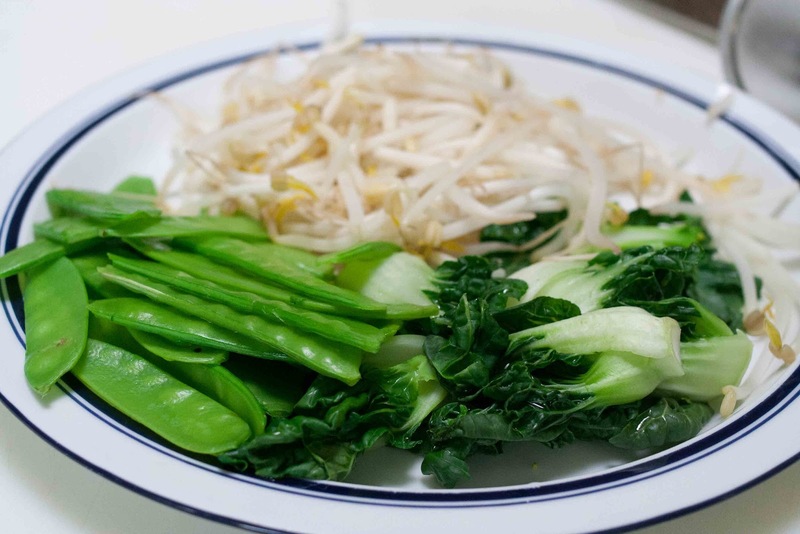 Immerse each vegetable in boiling water for about 10 to 15 seconds only. That keeps them from getting overcooked. After the ginger and garlic have been cooking in the soup stock for a few minutes, taste the stock. If it needs some more body, add some dashi--soup stock. 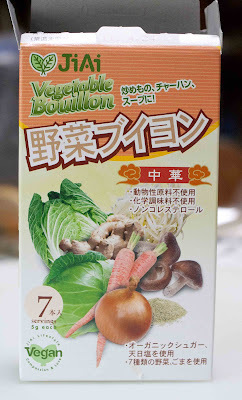 The dashi above is made from vegetables. The bonito flavored dashi is good in won ton soup. Or you can use konbu dashi. 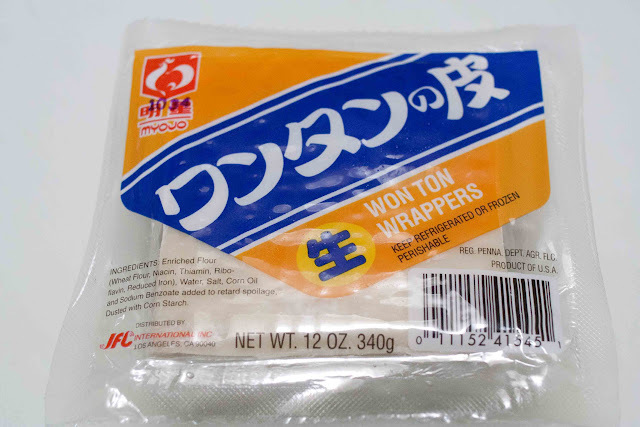 These are the won ton wrappers they had at Nijiya Market. Look at the date to be sure they're fresh. If they're old, they won't bend nicely, they'll crack. This is the sausage/mushroom filling I made for gyoza. If you're going to make won ton, use it the same day and freeze the won ton. It's not good to keep the filling for more than a day. 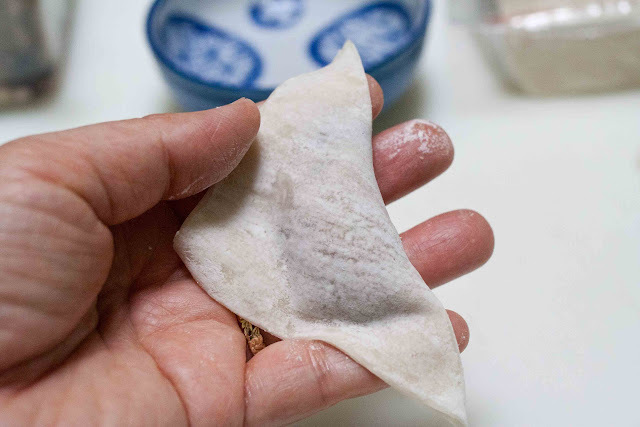 Moisten around the edges with a little bit of water and fold it in half, pressing it together firmly with your fingers. Put a dot of water near one corner, and bring the opposite corner over to overlap, then press firmly. 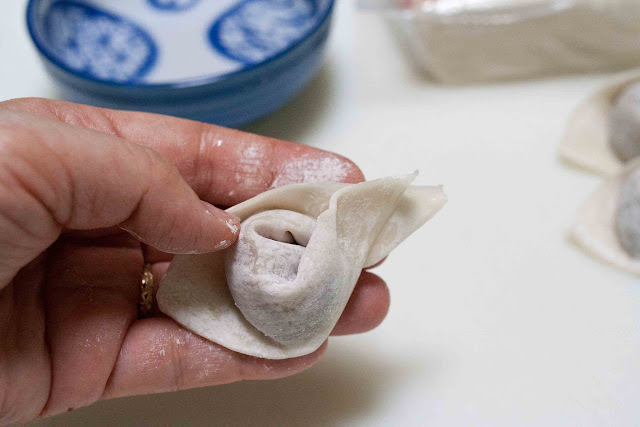 I like this shape for won ton soup, but you can also leave them flat. 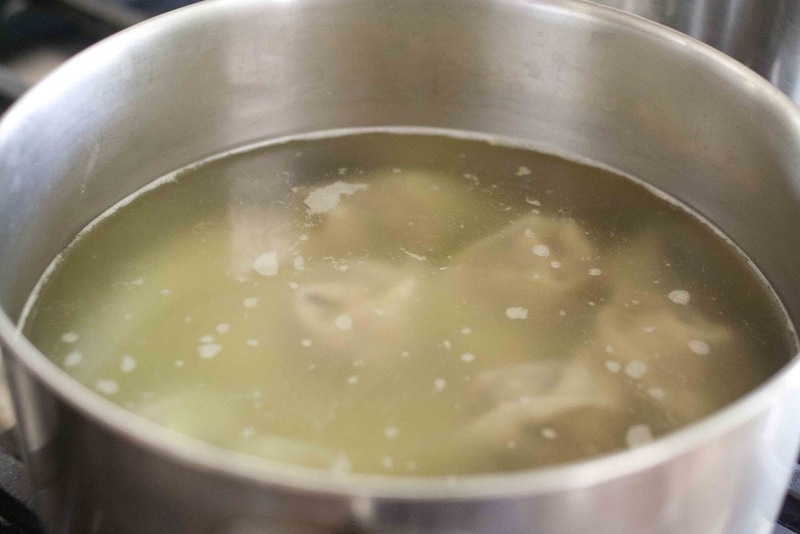 Drop the won ton into boiling soup stock or a separate pot of water. 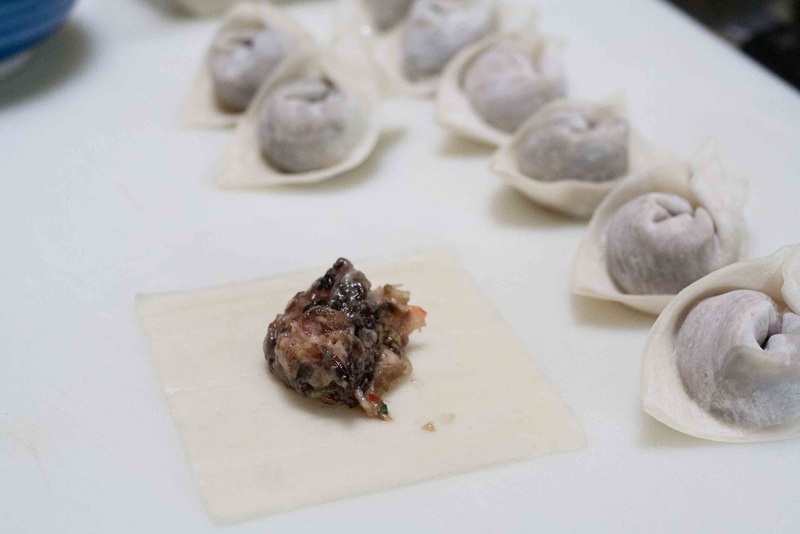 Cook for a few minutes over medium heat until the won ton float, then they're done. 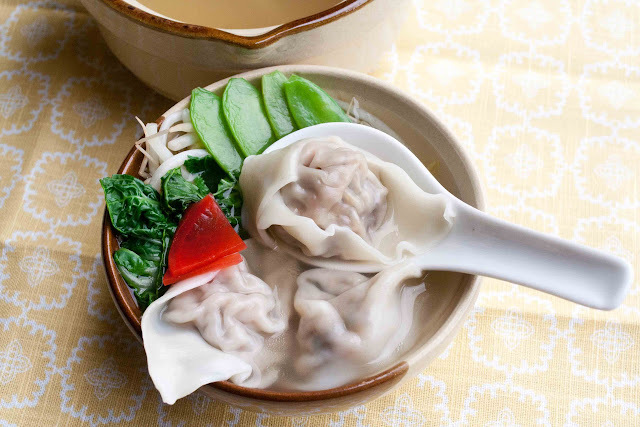 Spoon the won ton into soup bowls. You don't want to leave the cooked won ton in the broth, the noodles will expand a lot, so ladle them right into the bowl. 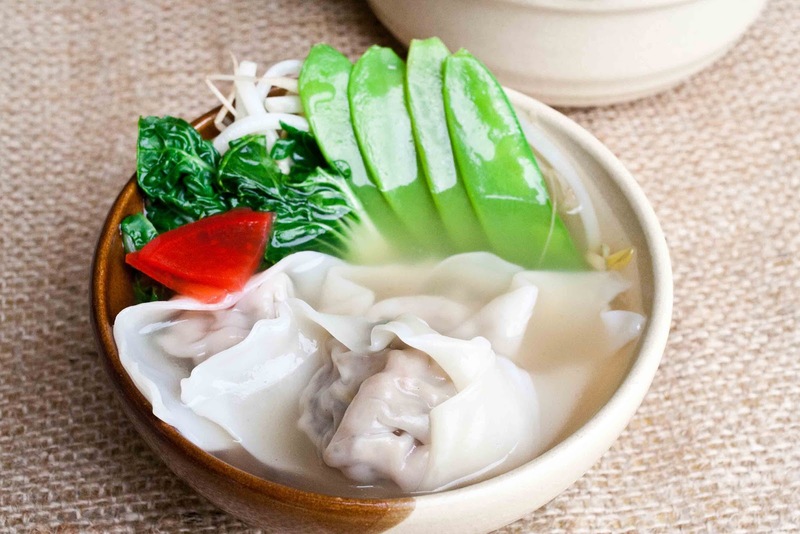 Put the blanched vegetables into a bowl with the won tons and ladle the hot stock over them. If you like a little dipping sauce, you can make some ponzu sauce with lemon juice, shoyu and a splash of vinegar and sriracha hot sauce. Sprinkle with some cilantro leaves and chopped jalapeno. This is my favorite won ton soup, the Hung Tao Won Ton Soup at the House of Louie Chinese Restaurant in West Covina. The won tons are fried, and the soup is thick, with little pieces of chopped barbecued pork, egg flowers, and cilantro in the broth. They serve it really hot, just as I like it. When I was a little girl, I went to Japanese language school, I've talked about it before. 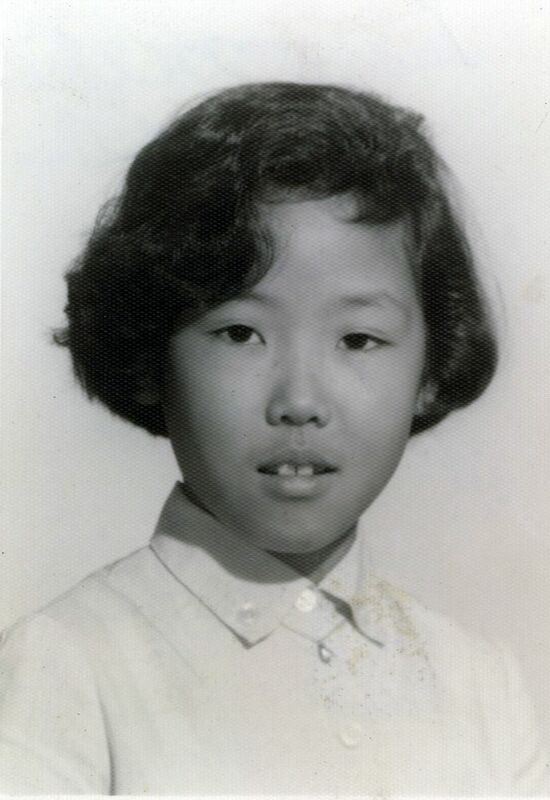 I was about 7 years old. It's tough being a new kid at Japanese school. Everyone already knows each other, and at recess, all the girls were in small circles, holding hands, and doing the Soupy Sales shuffle together. 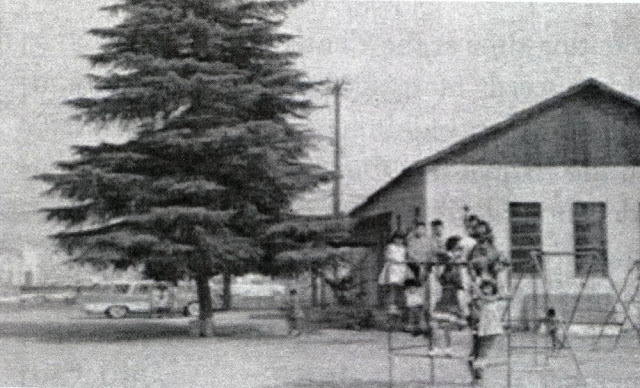 I remember watching them from the porch of the school. The girls would slide their feet--left, right, left-left, then right, left, right-right--all together, laughing and having fun. I couldn't do it--when I looked down at my feet, I just had two lefts, no rights. 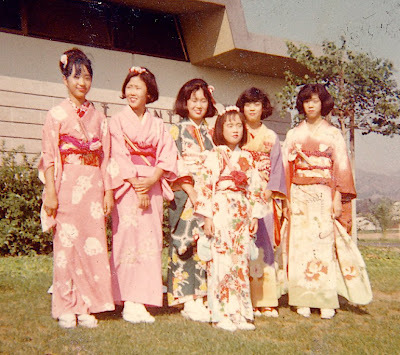 It can get lonely on the porch at Japanese school all by oneself, watching all the other girls having fun. Until you look around on the porch, see someone else, and make your own friend. She was new at Japanese school, too. She's a couple of years older than me, so smart, and so, so nice. I wanted to be just like her. Even more so, when she got these blue glasses. I remember thinking they were the prettiest, coolest things I'd seen. I really wanted a pair of blue glasses. But I didn't need them. 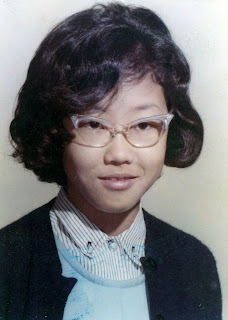 Susan used to let me wear her blue glasses at Japanese school. Except when she needed them. Then I had to give them back to her. Susan is second from the left. She recently told me she'd always admired my Japanese odori technique. She wanted to dance like me. I'd always admired her popular dance technique. We talked on the phone for hours and hours, all through high school. Once, one of my dad's friends had to use Emergency Breakthrough because our phone line had been busy all evening. I was talking to Susan. When she went away to college, we wrote letters. I still have the letter she told me she was in love with John, and another when she asked me to be her maid-of-honor in their wedding. We wrote when she moved around the country when her husband was going to graduate school, and when our children were small. Susan is still my role model. She's artistic and a talented artist, but doesn't know it. She's on a roller hockey team and is super-fit. She worked so hard for the past few years taking care of her aging, ailing parents--not an easy thing to do. She understands me, knows me so well, and always gives me the benefit-of-the-doubt--seemingly without thinking twice--when I stick my foot in my mouth. We're back to talking on the phone, sometimes with long conversations like when we were kids. 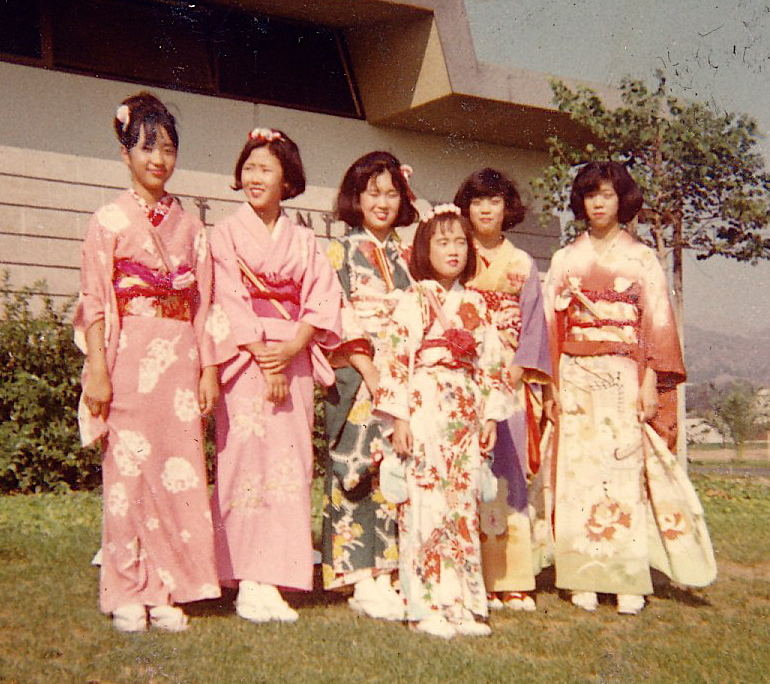 Feeling left-out and standing on the porch at Japanese school during recess wasn't so bad, after all. You never know when you'll meet a friend. 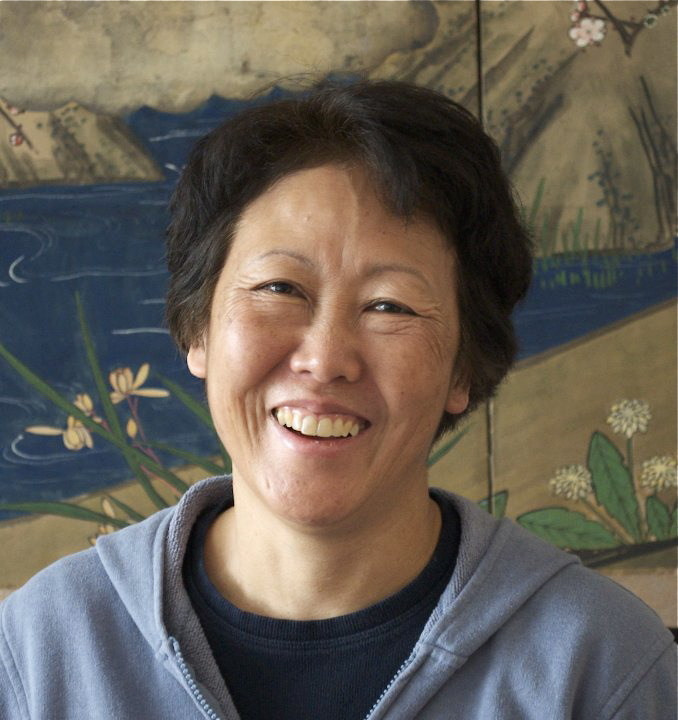 Thanks, Susan, for being a life-long friend. Karolyn, have you been offered a book or movie deal yet?? You are well on your way. I can just feel it! Thanks for the memories. I remember how everyone else was so much smarter and talented than me. Now that I'm an advocate for students in special education, I recall how difficult it was for me in "J-school" I couldn't read, just like students with learning disabilities. Except 3 DIFFERENT alphabets - katakana, hiragana, kanji. Who does that? 15 different ways to count things. Why? An "A" student in public school...I'm glad that they just moved us along and didn't give us grades or I would still be in 1st grade. I also know why some students with learning disabilities and other difficulties may also be behavior problems. It is always better to be bad than stupid. In "J-school" sometimes I was bad, but most of the time I just felt stupid. Just saw your post on Foodgawker. Looks delicious!